Typed A4 folded sheet listing a menu on embossed paper. Content shows a menu for a formal meal at the Officer's Mess Adam Park HQ on 13th June 1942 compiled by Capt DE Lowe. The menu states that this is the first such function. The menu was the property of Major D.E. 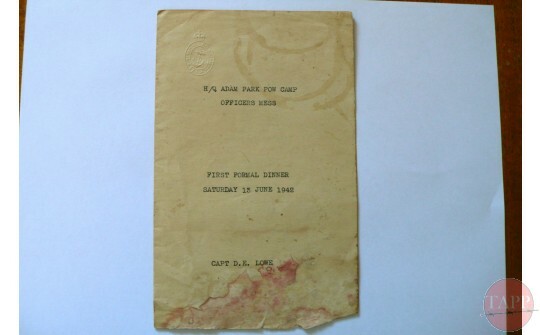 Lowe Royal Artillery and it was donated to the Virtual Museum by his son Peter Lowe A proportion of the Adam Park officer cadre was housed in the what became known as the 'Captain's House' . Other officer's bedded down with the men in the other accommodation houses. 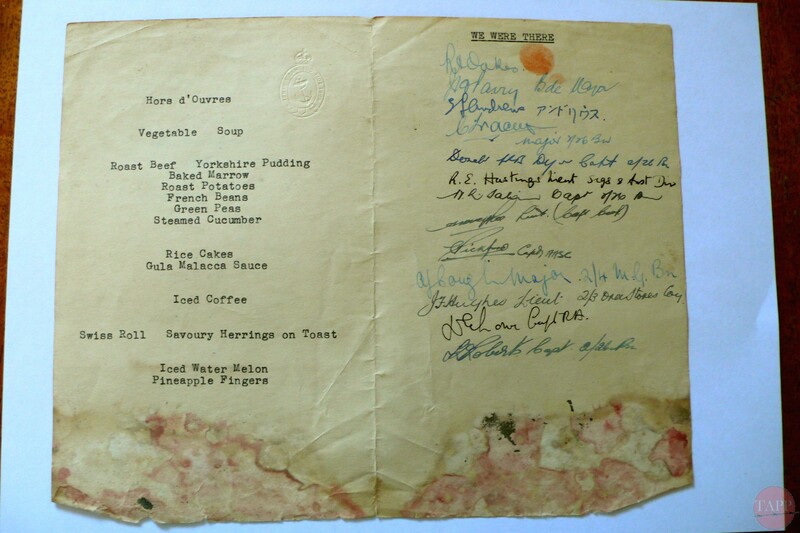 By mid June 1942 day to day life in the camp had been established and mess functions had been added to a long list of entertainments on offer to the POWs. 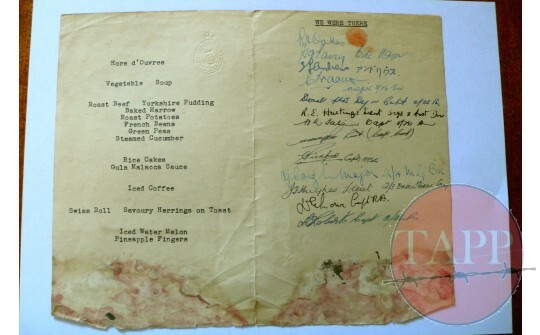 Sharing food, whether informally at chow time or as a part ofa more organised event was common place and a mark of respect as food although varied was not in plentiful supply and cost a fair proportion of the monthly pay. As is customary at Guest Nights the attending officer's have been asked to mark the occasion by signing the menu card. The following names are discernible: Lt Colonel Roland Oakes - Camp Commander Major Parry - Camp Adjutant Captain (Padre) Eric Andrews - Camp Interpreter (hence the added comment in Japanese) Major Tracey - 2/26 Bn Captain Dyer – 2/26 Bn Lt R E Hastings - 8 Division Signals Capt H L Sabin - 2/26 Capt H R Johnson - 2/26 Bn Unknown Capt Pickford – AASC Major A Cough – 2/4 MG Coy Lt Hughes 2/3 Ord Stores Coy Major D E Lowe RA Capt Roberts – 2/26 Bn The menu itself is impressive and certainly not the usual fare served up on a daily basis yet perfectly achievable under the circumstances. All this food would have been available either from the camp gardens, agreed rations or on the black market. Copyright © 2015 The Adam Park Project. All rights reserved.